The recently sworn in State Department secretary made his first address to the workforce on Tuesday, praising his new employees and promising to listen to and learn from them. Mike Pompeo, President Trump’s second secretary of State, called his workforce “the most important diplomatic corps in the world” in his first day at the department’s headquarters in the Foggy Bottom neighborhood of Washington, D.C. Pompeo was confirmed to the post last week, but quickly took off for a trip to Europe and the Middle East. 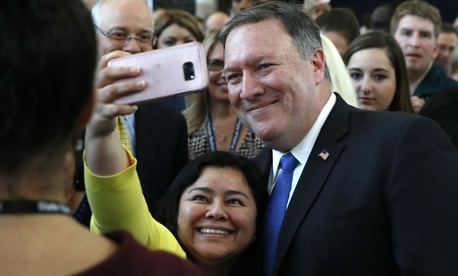 During his confirmation hearing, Pompeo promised to boost the State workforce by filling vacancies throughout the department. Vacancies at State have piled up during the Trump administration, with former Secretary Rex Tillerson instituting a hiring freeze that remains in place. In the first eight months since Trump took office, State’s workforce declined by 6 percent. Employees on the foreign affairs rolls dropped by 12 percent. State has over time loosened the hiring freeze to allow a range of exceptions, but has yet to publicly announce a full lift. Pompeo said he was unclear on the exact status of the freeze, but said he would end it if confirmed. Pompeo said he will enable State to get its “swagger back” by ensuring it has appropriate resources. "The United States diplomatic corps needs to be in every corner, every stretch of the world executing missions on behalf of this country,” he said. The secretary said he would in the coming days meet with members of the workforce to share his “commander’s intent,” his hopes for the department and his leadership style. Most important, he said, was to not “talk down to people.” He vowed to spend “as little time as possible on the seventh floor” of State’s headquarters, where the executive suites are located. “I know I have an enormous amount to listen to you about and to learn from you,” Pompeo said. Trump will travel to State on Wednesday to conduct Pompeo’s formal swearing in ceremony.